Blackinton B957 Eagle Badge with Panels - B957 - 2 1/2" x 1 13/16"
Home > Blackinton > Police Badges > Badges with Eagles > B957 Eagle Badge with Panels - B957 - 2 1/2" x 1 13/16"
B957 Eagle Badge with Panels - B957 - 2 1/2" x 1 13/16"
The Blackinton B957 is an oval badge with eagle at the top and decorative leaf design around the edge. You can personalize the four scrolled panels with department information and officer rank. Choose from a wide selection of full color seals that can be applied to the center. This Blackinton badge measures 2 1/2 x 1 13/16 and is manufactured with pride in the USA. Please allow 4-6 weeks for the badge to be delivered as these are made to order. 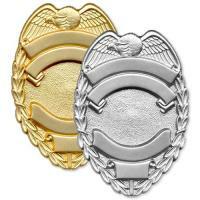 Eagle Badge with Panels - B957 - 2 1/2" x 1 13/16"
©2002-2019 CopsPlus.com: Blackinton B957 Eagle Badge with Panels - B957 - 2 1/2" x 1 13/16"